AR Fabrication is a world-class engine machining facility specializing in Darton™ block sleeve installation and engine blueprinting. Because there isn’t one solution for every scenario please email or call us at 540-722-DYNO (3966) for a FREE consultation to discuss your engine build. We’re open Mon. – Fri. 8 a.m. until 5 p.m. and Sat. from 8 a.m. until noon. Example of how a block should be packaged in a plastic tote. Strip the block of all bolts or plugs. Remove all head studs, external studs, and all sensors and senders. We will NOT be held responsible for items that have to be removed for machining purposes. 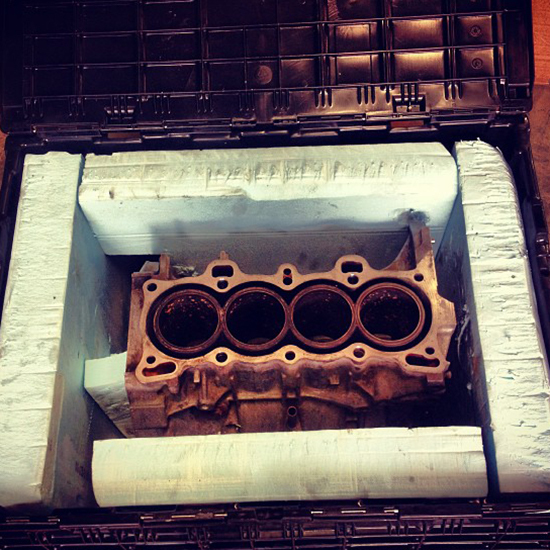 Degrease the block and clean it so there is no dripping oil. There will be an additional charge of $50.00 if the block is still oily or greasy. Use a plastic tote, double wall cardboard box, or triple wall cardboard box. Pack with cardboard or foam all the way around the block, including the top and bottom. There should be at least 2 inches of padding on each of the four sides in order to protect the block. DO NOT USE PACKING PEANUTS Packing peanuts cannot sustain the weight of a block if dropped.When packaged correctly, there should be little to no movement allowed when the box is sealed. Please print and fill out our Block Sleeving Customer Info Form 145 KB and put in the box. If you aren’t comfortable throwing this box out of the back of a truck to the ground you probably didn’t pack it well enough, go back to step 3.